Pennsylvania’s Tower Builder and Tower Services company. Providing state of the art products, site design, construction and maintenance services. Our common primary infrastructure items are featured, however they represent only a sampling of our total product line. TSU is a Pennsylvania State Contract vendor for towers, shelters, generators and related items..
We’ve been building communications tower sites since 2002. The experience embodied by TSU, however, spans decades. Repair, Troubleshooting, Preventative Maintenance, and New Equipment Installation. We understand 24/7 communications is crucial to 911 public safety providers as well as to private wireless carriers. We also understand how to ensure that occurs. Lightning does strike twice in the same place and we can help you prepare, prevent and, if necessary, recover. Tower Services Unlimited tests lines and connectors, replacing faulty items, and provides you with detailed reporting and analysis. Eliminate the guesswork in tracking lower than expected receive signal levels. Reduce liability and improve security with a quality fence and gate system. Avoid allowing communications systems to fall victim to vandals hunting your copper investment. Contact us to discuss the communications site services we provide. TSU offers tower, shelters, generators and dozens of other products related to site communications. We are proud to offer Pennsylvania State Contract pricing, under the IT & Communications Equipment & Services category, to agencies of and within the Commonwealth of Pennsylvania, including county and local government entities. 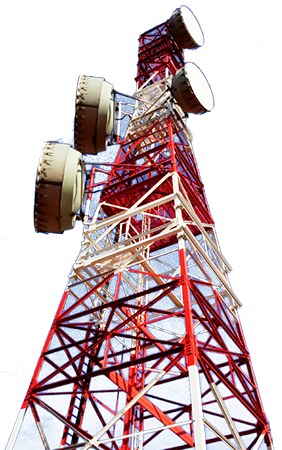 Contact Tower Services Unlimited to discuss your wireless communications infrastructure needs. Tower Services Unlimited, Inc. (TSU) has been constructing and maintaining RF communications tower sites since 2002. The experience embodied by TSU, however, spans decades. Tower Services Unlimited, Inc. provides services to the private sector as well as to various agencies within the Commonwealth of Pennsylvania and municipal goverments. TSU is fully bonded and insured for state and local government contracts. Are you ready to learn more on how TSU can help you? Pennsylvania’s Tower Builder and Tower Services company. Providing state of the art products, site design, construction and maintenance services. We’ve been building communications tower sites since 2002. The experience embodied by TSU, however, spans decades. TSU offers tower, shelters, generators and dozens of other products related to site communications. We are proud to offer Pennsylvania State Contract pricing, under the IT & Communications Equipment & Services category, to agencies of and within the Commonwealth of Pennsylvania, including county and local government entities. Contact Tower Services Unlimited to discuss your wireless communications infrastructure needs. © 2016 Tower Services Unlimited, Inc.